This review for Wuthering Heights is full of spoilers, but I would surprised if you don’t already know the story. 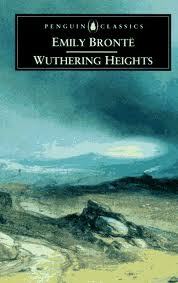 It took me a long time to read Wuthering Heights. I have seen so many different versions of Wuthering Heights, Pride and Prejudice, Persuasion, Jane Eyre and others that sometimes my husband is convinced that I single-handedly send the children of BBC executives to college. With all of the versions of Wuthering Heights that I have seen, I felt sure I had the story nailed down. A story that without a doubt always makes me cry. I story that was so full of love and hate that many people were doomed to end up unhappy. When I finally picked up this book a few years ago, it took me chapters to shake off the preconceived notions I had of Heathcliff as a great antihero. Passionate, misunderstood and dark. I had to rid myself of the notions that Cathy was a sad victim of circumstance. The two of them together instead, are full of tantrums, unspoken promises, selfishness and obsessiveness. Their selfishness and presence is so strong it is felt years after death, haunting those around them, making themselves and others miserable even through the grave. This dark and fulfilling story follows Cathy and Heathcliff, childhood sweethearts through their passionate and almost violent love and their eventually separations when Heathcliff leaves only to return to find Cathy married to someone else. It then follows Heathcliff through the madness of morals that comes, with his desire to exact revenge on anybody who had ever wronged him, even to the next generation. It then moves onto this pain with Cathy’s death and the years of unquiet his soul feels. His has wrapped so much of his heart and his soul up into her that one of his true desires in life is for her spirit to haunt him, to be buried next to her with the sides of the coffins removed so that they will mingle forever. It doesn’t seem like it could be a wonderful story of love and redemption when the entire book seems full of emotional torture. The isolation of the two families from almost anybody else, creates an atmosphere of desperation. They are desperate to be close to each other and then desperate to be away with really nowhere else to go. They love each other with a twisted obsession, they manipulate and betray and ultimately make themselves unhappy. There is no redemption for them in this life, the only redemption comes from the love their children will eventually have for each other. Almost like Heathcliff and Cathy’s love played over again this time with happiness and redemption. Wuthering Heights is a rare book. The characters are mad, manipulating, obsessed and I love them. They are kind of like the train wreck that you can’t look away from. Heathcliff is not a romantic hero. Cathy is not a damsel in distress. Did they deserve their unhappy fate? Maybe not, but they definitely deserved each other, selfishness and all. There are no tears shed for them at then end of the book. They don’t need or deserve them. We see at last happiness between Hareton and Catherine and Cathy and Heathcliff are perhaps at last redeemed. The true story of Wuthering Heights is very different from the movies. I guess you can only fit so much into two hours and two hours is not enough time to contain the dark, twisted lives of Heathcliff and Cathy. Wuthering Heights will always be one of my favorites. It is a book that polarizes people. You either love it for all its mysteries or hate it for the nonexistent likability of the characters. Me? It could read it over and over. I cannot express it; but surely you and everybody have a notion that there is or should be an existence of yours beyond you. What were the use of my creation, if I were contained here? My greatest miseries in this world have been Heathcliff’s miseries, and I watched and felt each from the beginning: my great thought in living is himself. If all else perished, and he remained, I should still continue to be; and if all else remained, and he were annihilated, the universe would turn into a mighty stranger: I should not seem a part of it. My love for Linton is like the foliage in the woods: time will change it, I’m well aware, as winter changes the trees. My love for Heathcliff resembles the eternal rocks beneath: a source of little visible delight, but necessary. Nelly, I am Heathcliff! He’s always, always in my mind: not as a pleasure, any more than I am always a pleasure to myself, but as my own being. I read this when I was quite young and I too was overwhelmed with the incredible ego-centric behaviour and self absorbed obsessions. Not one of my favourite Bronte books BUT I still applaud the writer. The Bronte sisters amaze me with the depth of passion and drama in their literature for the age and society they were living in and how popular their stories still are today. Surely, they too enjoy the same level of acclaim and notoriety as Shakespeare himself. It was good to read your review and I hope it encourages a lot of people to read the novel because you are right, it is hard to capture in a couple of hours of film. There is a lot more subtlety and depth and best of all, you can re-read and re-read some of thos wonderful passages and speeches absorbing them like literary nectar. I had always shunned fiction, as though it were not worthy of my time, i.e. I was not 'learning' anything from it. Then two friends kept after me until I read the first Jane Austen novel. I couldn't believe what I'd been missing all this time! Now all those period dramas are riveting, in my opinion. I have not read Wuthering Heights, but when I find a copy with good line spacing, I will definitely tackle it! Thanks for your great review! I am so glad to read a review that mentions just how UNlikable Cathy and Heathcliff are. Unlikable but compelling. I am not a huge fan of Wuthering Heights, never have been, but I do have the utmost admiration for the power of Bronte's prose. There are passages that I can read over and over, as they stand alone on their own merit and are just incredible bits of literary genius.